Keeping you up to date, wherever life takes you. geographical, astronomical and weather data. Working across the world can be as easy as working across town. Time Palette's world clock includes a gazetteer with detailed geographical and time zone information for 10,000 cities throughout the world. The gazetteer maintains comprehensive rules for Daylight Saving Time (Summer Time), giving Time Palette a level of accuracy unmatched by other applications. Complete details on sunrise, sunset, moonrise and moonset are displayed for any city and date, along with the phase of the moon, and more. A map within Time Palette lets you see the Earth as it currently looks. Includes two maps, 11 projections, and 10,000 centering locations. Intuitively plan global conference calls so they are convenient for everyone, whether their office is in San Francisco, Johannesburg or Singapore. Set multiple independent alarms for any time zone. Time Palette can remind you when markets close in Hong Kong, or when business opens in Dubai. Calculate your airline miles the easy way! Time Palette handles multi-segmented and open-jaw trips, helping you maximize your air itineraries. Access current US weather conditions via Time Palette. Weather information from NOAA is updated frequently throughout the day. 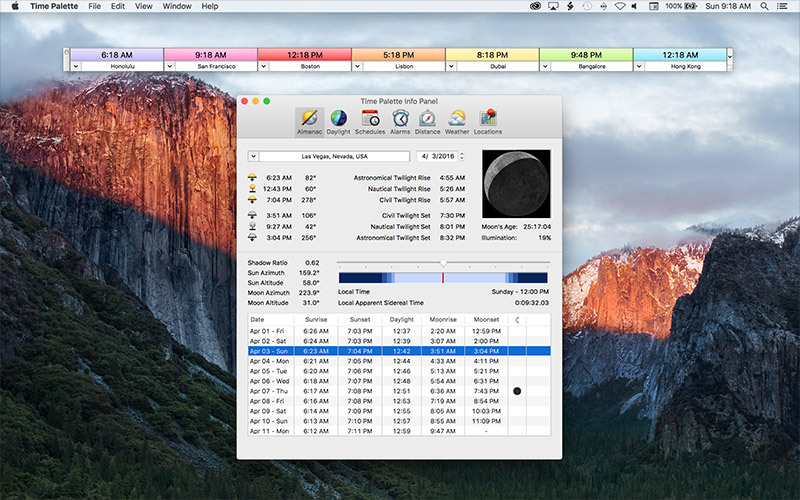 Time Palette requires macOS 10.6 or newer.